This 31 Larson’s performance is attributed to the patented Duo-Delta Conic running surface and boasts a unique transom platform design that totally enhances the cockpit. A lift-out storage box located below the aft seat makes it easy to transport gear to and from the boat. The forward cabin area includes comfortable curved seating, a lift-out dinette table, and filler cushion to create a large comfortable berth. Standard equipment is anything but standard on the Cabrio 310, as it includes shore power, city water hook-up, VHF radio, fully enclosed camper top, sport arch with TracVision Satellite TV atop (added on), has less than 375 hours on the engines (recently serviced), new tilt/trim, new raw water pump, and new depth sounder. She shows in “Like New” condition, and is stored indoors under cover after each and every outing. 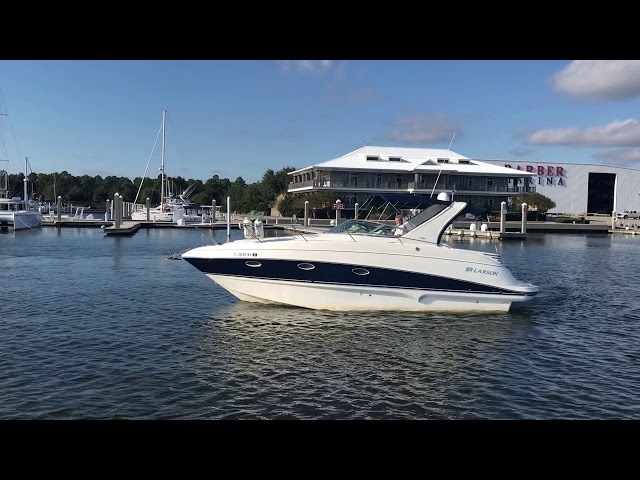 West Florida Yachts would love to guide you through a personal showing of this 31' Larson Cabrio 310 2007. This yacht for sale is located in Elberta, Alabama and priced at $52,000. For a showing please contact us by filling out the form on this page and we will get back to you shortly!